The pioneering technology used in the making of Live targets and evaporates water molecules without disturbing the active enzymes, antioxidants, vitamins, or minerals in the original material. Whole, freshly picked produce becomes a fine powder that retains 100% nutrition, as well as full flavor, aroma, and color. Live provides whole food nutrition not combined anywhere else in the marketplace. You can lose weight, increase your energy and feel more alive - you better believe it. When you start drinking one bottle of LiVE a day, you can immediately notice changes in how you feel. Most people sleep better at night and awaken feeling rested and alert. Many find they can think more clearly and feel more energetic throughout the entire day. LiVE doesn’t merely provide long-term health benefits - it delivers an immediate, noticeable change in how you feel. Mix with 4 - 6 ounces of water and drink. Galaxy® is a high impact liquid nutritional supplement containing 32 bioactive components from high antioxidant super fruits and vegetables. Juuva's Energy Cup is the next generation of creating affordable and portable alkaline water. It contains a proprietary blend of scalar energy. ZING™ delivers instant and sustained energy in a delicious drink mix that replaces sugar-loaded and chemically caffeinated beverages. 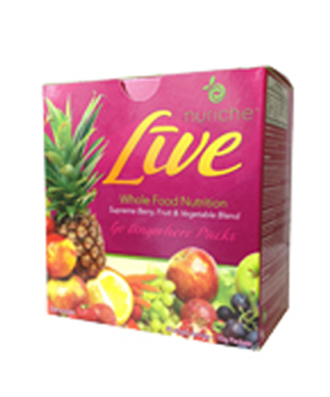 Each LIVE™ stick pack provides the nutritional servings of fruits and vegetables your body requires daily.